It is easy to apply because it flows off through the brush or roller unlike oil-based paints that are sticky. It emits practically no odor. It can also be painted over a damp surface and preferred by people living in damp places. Unlike oil-based paints, latex allows moisture to escape, therefore, eliminating the common problem of peeling and cracking associated with oil-based coatings when moisture escapes or attempts to escape from the surface. It is usually white in color and possesses reflective properties. It costs less than solvent-based paints. Acrylic latex paint has less tendency to fade or become yellowish compared to oil-based paint. The latter loses part of its color from chalking, which is not present with acrylic paints. Latex paint retains flexibility through time. 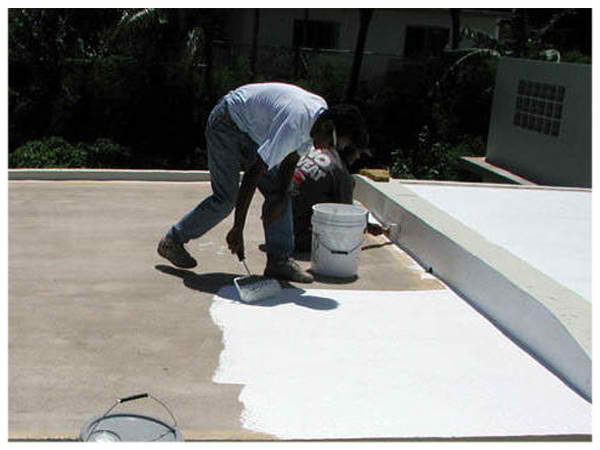 Acrylic is preferred as coating for plaster and cement because it is not sensitive to alkali. Less harmful impact on the environment and is not treated as hazardous paint. It dries easily and has therefore reduced curing time. You can apply a second coating after only about four hours. The paint could run if it rains before the coating has fully dried. It cannot be applied in the rain or when precipitation is expected. It takes a very long time to dry under extremely high relative humidity. It cannot be applied in extremely cold weather because water freezes. Thus, acrylic paint cannot be used throughout the year. The temperature at night must be considered by the contractor and not only during the daytime. Cold temperature at night might present problems because of freezing of the coating. The roof temperature must also be considered and not only ambient temperature. It has shorter lifespan because of relatively-poorer bonding with the surface unlike oil-based paints. It has less resistance to abrasion. It requires more surface preparation and does not stick to dirty or more weathered surfaces unlike oil-based paints.